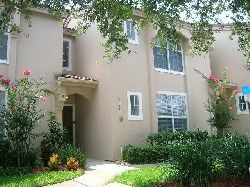 Mango Key is a small, friendly, gated community of 33 two and three bedroom townhomes. When not on holiday themselves most owners offer their property for vacation rental. The management company that looks after our home have their office on-site at Mango Key so help and support are readily available. 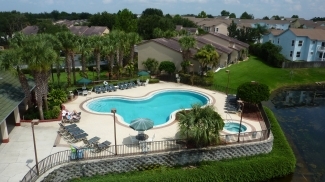 Walt Disney World is less than a 10 minute drive so you can combine the convenience of a great location with the space and comfort of our 2 bed, 2 bath townhome. We have ample parking space right outside the front door for ease of access (no flights of stairs to climb). Supermarkets and superstores are located minutes away on the US192 Highway. Our two storey home has a master bedroom with queen sized bed, walk in closet and full bathroom en-suite. Upstairs the second bedroom has 2 twin beds with walk in closet and second full sized bathroom en-suite. 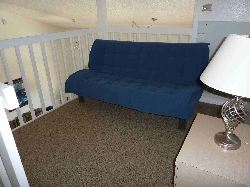 The large loft (landing) has a double sleeper futon and is set up with a drawer unit and lamp. 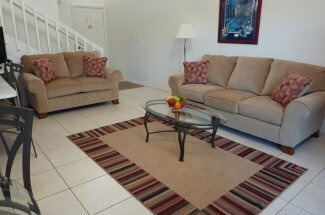 Our living area features two comfy sofas, a dining area and breakfast bar. 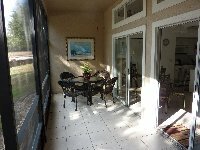 Two sets of patio doors open onto a fully screened, tiled lanai (patio) equipped with a sofa and a full patio set for outdoor dining whilst the screens keep out uninvited guests. The fully equipped kitchen has everything you need in a luxury home. For your entertainment we have free wi-fi high-speed internet connection. 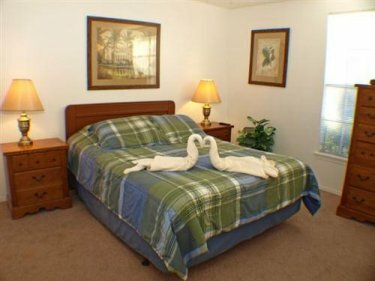 Both bedrooms feature flat screen TVs. Whilst the lounge has a large flat screen HD TV, DVD/VCR and CD/radio. The very large free-form swimming pool is the 'jewel' in Mango Key's crown. Our pool is fully heated (at no extra cost) year round. A spell in the sparkling jacuzzi is the perfect way to revitalise after a day spent 'hitting' the parks. The pool deck features plenty of loungers and tables with parasols. Sun or shade - take your pick! When you compare the space and comfort that Mango Key has to offer with that of an over-priced hotel room why would you stay anywhere else? Our top tip - return 'home' for a mid-day break and swim before heading back to the parks for nighttime fun. You'll be glad you did! Welcome home to Mango Key.